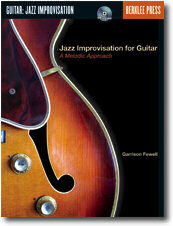 Garrison Fewell, a very nice american jazz guitar player, from Berklee, can boast many important collaborations. Moreover he is one of the most appreciated educator. He has been defined the Bill Evans of the guitar. You can directly contact Garrison writing at the address gfewell@earthlink.net. Grant Green's Blues: Dog it (Part one). Grant Green's Blues: Dog it (Part two). It includes tablature for guitar and comes complete with a 90+ track cd with back-up trio tracks for play along exercises by Garrison, bassist Steve LaSpina (a long time collaborator with guitarist Jim Hall) and drummer John Riley. audio tracks of all the musical examples.